Highs and Lows of Birding: Irish Birding. Part 2 . Rain, rain and more rain !! Irish Birding. Part 2 . Rain, rain and more rain !! 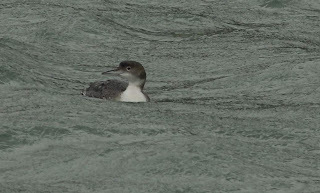 Having had enough of the rain and wind at Killibegs we headed off towards Sligo via various coastal stops to scan for Scoter, Divers and Geese. 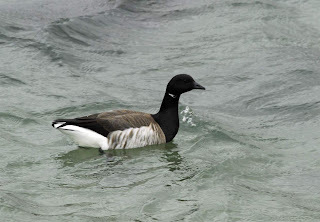 As a South East birder, Pale bellied Brent Goose is a bit of a goodie down South whilst in Ireland they are common and replace the dark bellied Brents that we see in most of the UK. A cracking little Goose seen at close range at several localities plus some distant Whooper Swans, a solitary Purple Sandpiper associating with some Turnstones and a bevvy of Great northern Divers GND's another bird we see infrequently in Kent. Add these to Hooded Crows everywhere, and the thousands of Barnacle Geese on show late afternnon, yep in the rain !!! it was turning out to be a great introduction to birding Ireland in the winter. Constant scanning eventually allowed us to all see a Richardson's Canada Goose pretty well amongst the Barnies, just rewards for the scanning in the inclement weather. Job done, it was a final stop at Sligo for some bread throwing and sure enough from nowhere a superb 1st year Iceland Gull cruised in and a Peregrine put on a good show. A cracking day, ended in Crockets on the Quay at Belamina for some great grub and a well earned nights kip. 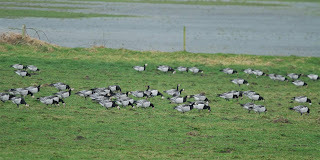 A small part of the Barnacle Goose flock, there was also a Pink-footed Goose present, scarce here.